A favorite for years, this baby spoon is colorful, easy for baby or toddler to hold and use and a great gift. Made of sterling with a tough Lucite handle filled with food-grade mineral oil, which colorful metallic beads and squins are suspended in oil. 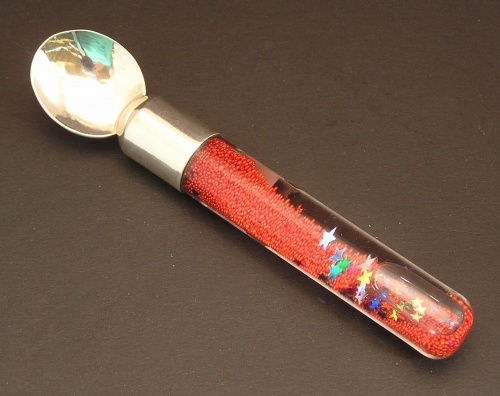 As you turn spoon around, the beads and squins move in the oil, creating a waterful effect. This is my most popular baby spoon and frequently requested as gifts. Can be ordered in other colors - apple or bright green, purple, black, silver, gold, red and teal. Available for immediate delivery is one black/metallic blue handle spoon, one teal handle and one metallic apple green handle spoon. Size: 4 3/4" x 1"